Abney Park Cemetery, one of London's 'magnificent seven' private cemeteries, opened in 1840 to meet the need for Non-Conformist burial. The chosen site was formerly part of the grounds of Fleetwood House and Abney House, both important as meeting places for Dissenters; hymn-writer Isaac Watts stayed in both houses and has a monument in the cemetery. With a fine chapel as the centrepiece, it was laid out as a garden cemetery and landscaped by George Loddiges with plants supplied from his nursery in Hackney. It had an extensive arboretum and a rosarium, and some earlier features from the former grounds were retained. It was enlarged in 1843, again landscaped by Loddiges, and continued to develop until the 1870s. Many important Non-conformists have been buried here. Now run by Abney Park Trust, it is managed as a nature reserve. Rail: Stoke Newington. Tube: Manor House then bus. Bus 67, 73, 76, 149, 243, 393, 476. Abney Park Cemetery was one of seven private cemeteries created to meet the need for Non-Conformist burial grounds in London, Bunhill Fields (q.v.) being full. Opened in 1840, the cemetery was laid out on the grounds of the Abney and Fleetwood estates. What became known as Fleetwood House had been built in the 1630s for Sir Edward Hartopp, and fronted onto what is today Stoke Newington Church Street; it was surrounded by gardens and c. 8 acres of land predominantly to the north. In 1664 Mary Hartopp married Charles Fleetwood, one of Oliver Cromwell's generals, and the estate passed to the Fleetwood family who retained it until 1766, after which it passed through a number of hands, becoming a Quaker School by the 1820s run by William Allen and Grizelle Birkbeck. The house was a meeting place for Dissenters. Isaac Watts (1674-1748), writer of hymns such as 'O God Our Help in Ages Past', stayed at Fleetwood House in 1696 and was also involved in the planning of Abney House where he later lived from 1734 until his death, which was built for Thomas Gunston (1667-1700) on adjacent land to the west of Fleetwood House. The designs of the gardens of the two houses were linked. Thomas Gunston died just as the house was completed and it was inherited by his younger sister Mary who married Sir Thomas Abney, from whom the house takes its name. Abney was Lord Mayor of London, a Non-Conformist and one of the founders of the Bank of England; the property remained in the Abney family until 1782. The Eade family then owned the estate until the 1810s after which it was divided up for a time, but then largely reunited by J W Freshfield who also purchased the Fleetwood Estate in 1827. In 1839-1840 plans were drawn up to develop the new, private Non-Conformist cemetery on the Abney and Fleetwood lands, retaining many of the C17th and C18th garden features such as the Great and Little Elm Walks and the Yew Walk. The Abney Park Cemetery Company was formed and in 1840 the cemetery was laid out with chapel, entrance gates and lodges built to the designs of William Hosking, who was later Professor of Architecture and Engineering Construction at King's College London. The Egyptologist Joseph Bonomi Jnr. influenced the entrance gates on Stoke Newington High Street. Fleetwood House and Abney House were not part of the cemetery lands, and Abney House was used as Wesleyan training college until its demolition in 1843 at which point it was incorporated into the cemetery; the old entrance gates still stand on Church Street. Fleetwood House was demolished in 1872. Abney Park was from the outset conceived as a garden cemetery with an arboretum of some 2,500 trees, the largest collection of trees in the country, and a 3-acre rosarium with over 1,029 rose varieties. George Loddiges (1786-1846) was responsible for landscaping and planting the cemetery, which included every plant in the collection of his famous Loddiges Nursery, which also gave financial backing to the Cemetery Company. Loddiges Nursery, which 'had a 120 foot tropical rainforest on Mare Street', was founded in Hackney in 1760 by a German, John Busch, and was taken over in 1771 by another German, Conrad Loddiges. From 1777 catalogues were issued showing the nursery's remarkably rich collection of plants, concentrating on trees and shrubs, which acted as the point of reference for species of woody plants at that time. After Conrad's death in 1826 Loddiges Nursery was run by his son George who continued to develop the nursery and send out collectors, and who produced a finely illustrated Botanical Cabinet (1817-1834). The complete list of plants and a description of Abney Park Cemetery, with illustrations by G Childs, was published in George Collinson's 'Cemetery Interment' (1840) and J C Loudon praised it as 'the most highly ornamented cemetery in the neighbourhood of London'. At that time Kew Gardens (q.v.) was a quarter of the size, in a bad state of repair and not publicly open. The cemetery was enlarged in 1843 when Abney House was incorporated into the cemetery, again landscaped and planted by Loddiges. The cemetery continued to develop until the 1870s when the New Road was laid out linking the entrance drive to the catacombs, after which no major alterations were made. A statue of Isaac Watts by E H Baily was erected in 1845 in the centre of the cemetery, although Watts was buried at Bunhill Fields. His favourite spot in the Abney's garden is still marked in the north east of the cemetery, known as Dr Watts' Mound, where there was once a horse chestnut tree. This is now cleared of undergrowth and has a plaque after the mound was rebuilt in 1993 as part of a Horticultural Training Programme. Among the numerous important tombs and memorials are those of General William Booth and Catherine Booth, founders of the Salvation Army, and members of the Loddiges family; Cromwell's daughter Bridget Fleetwood is buried under the cemetery chapel. The original cemetery company sold the Abney Park Cemetery to a commercial company in the 1880s who continued to run it until they went into liquidation in 1974. It became badly neglected and closed in 1978 but was then purchased by the London Borough of Hackney in 1979. 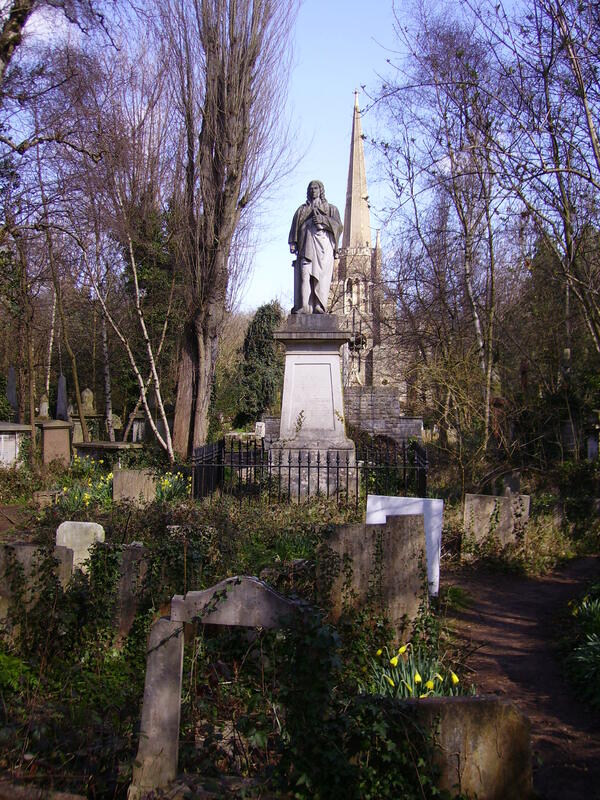 In 1992 Hackney Council granted a 21-year lease to maintain the cemetery to the Friends of Abney Park, who formed Abney Park Trust. Since then the cemetery has been improved and declared a nature reserve; works have included re-planting of the original arboretum trees. Since 1993 the entrance from Stoke Newington High Street has been renovated with new planting and a driveway with granite setts and York stone slabs recycled from Hoxton Market. Abney Park Trust has a visitor centre in the front lodge and runs numerous educational projects, including in creative arts and aspects of horticulture, and is an Accredited Training Centre for City & Guilds. A children's garden has been created. Future plans include repairs to entrance gates and the Chapel. At the expiry of Abney Park Trust's lease on 20 May 2015, Hackney Council resumed management of the cemetery, although the Trust continues to have close involvement in educational and community work. EH Register Upgrade (1998); John Wittich 'London Villages', (Shire Publications) 3rd ed. 1987; Ben Weinreb & Christopher Hibbert, 'The London Encyclopaedia' (Macmillan, revised ed. 1993); Bridget Cherry & Nikolaus Pevsner, The Buildings of England: London 4: North (Penguin, 1998); Arthur Mee 'The King's England: London North of the Thames except the City and Westminster' (Hodder & Stoughton Ltd, 1972); Paul Joyce, 'A Guide to Abney Park Cemetery' (Abney Park Cemetery Trust, 2nd ed. 1994); various Abney Park Cemetery leaflets; John Harvey 'The Nursery Garden' (Museum of London, 1990). Also see Abney Park Trust website.